I bought a PC without optical drive and there is no option to borrow it for a short time. So I am using Rufus to create a bootable USB stick. I have a 16Gb Toshiba USB drive. Using a Rufus's built-in FreeDOS image I found that "MBR partition scheme for BIOS or UEFI-CSM" is the only option to create bootable USB drive that the motherboard understands and boots from. Then I created a test USB drive with Ubuntu 12.04 LTS setup and installed it without any issues. When I try to write Windows Server 2008 image which is of 3GB size, I can write the USB stick either with "MBR partition scheme for UEFI" or "GPT partition scheme for UEFI", but my AsRock motherboard can't boot from this stick. and then it may wait forever. User interface is responsive, but the only way to terminate Rufus is to kill it in task manager. It happens only when I use NTFS with this partition scheme. 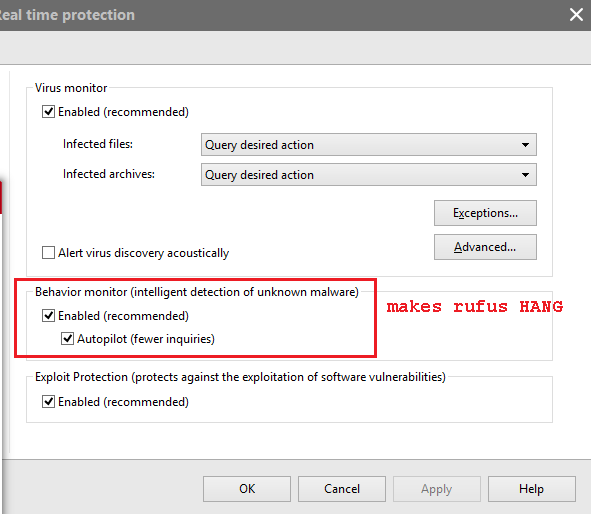 you should check for any antivirus software conflicting with rufus. To ensure that the USB flash drive is UEFI bootable, change Partition scheme and target system type to GPT partition scheme for UEFI. I had the same problem then I did this and it worked. Rufus dev here. The problem is that the Manjaro people put a bit too much faith in ISOHybrid, and seem to have forgotten that, yes, there are some people who want to create an UEFI bootable drive by simply copying the ISO files to a FAT32 file system (which is pretty much what Rufus does for UEFI boot). So they didn't bother including a FAT32 driver into their GRUB EFI bootloader. The GRUB bootloader runs and starts to looks for its configuration files on a file system it can handle... but since the Manjaro people have only included a module for ISO9660 file systems in GRUB, and not FAT32, it can't find that file and bails out with a prompt. Note that we have reported this issue to Manjaro months ago, but they still haven't done anything about it. So if you want to help, please pester them to address that issue, as we have reasons to believe it should be exceedingly easy to fix, and would avoid many more Manjaro users to run into this easily avoidable issue. And of course, as was correctly suggested, you can always fall back to using "DD mode" when prompted by Rufus to work around that problem. Not the answer you're looking for? Browse other questions tagged mbr usb-boot rufus or ask your own question. Why can't I install Windows 8 on an UEFI machine from an MBR based USB disk? Booting with MBR in UEFI (No CSM mode at all)? How to create MBR bootable Windows USB installer from Linux? How does a MBR in USB drive works?